Thanksgiving Day is just around the corner, so I'm sure you've started to make plans for smoking that perfect holiday turkey. And if you haven't, then it's time to get all your ducks turkeys in a row! After you've decided on a smoked turkey recipe, it's a good idea to do a practice run a couple of weeks before the big day. This will give you a chance to evaluate the results so you can make adjustments to the seasonings or cooking technique if necessary. For more information, check out one of the following links. I did a practice run yesterday and smoked a Honeysuckle White bone-in turkey breast in my Masterbuilt electric smoker. 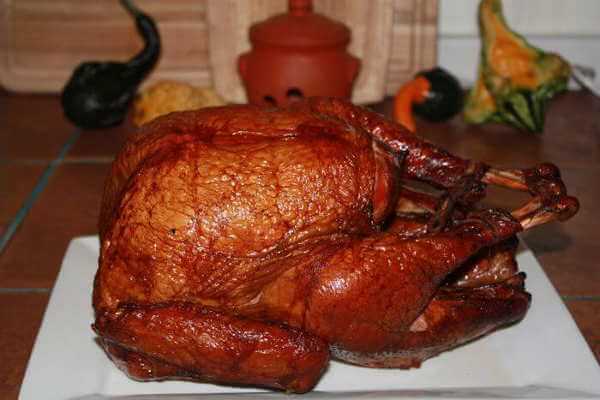 I've smoked all sorts of meats in it over the last few years, but never used it for turkey. I found that my Masterbuilt smoker did a great job smoking that breast! I was also curious to find out how the Honeysuckle breast would taste without any added herbs or spices. The label states that the breast is "basted with 15% of turkey broth, salt, sugar, natural flavoring". All I added for flavor was a sprinkle of Kosher salt. After 4 hours of smoking at 275° Fahrenheit, the Honeysuckle breast reached its target temperature of 165°. 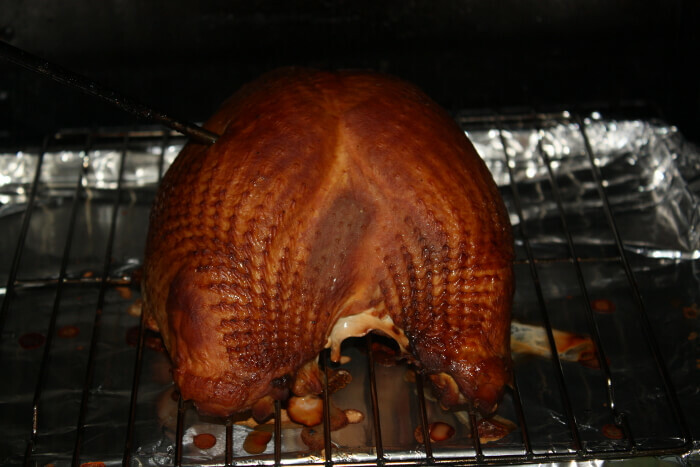 It had a great smokey flavor from the applewood chips I used, and it was nice and juicy. The flavor was OK, but a little on the bland side. A good dry rub would've made it a lot better. Do you have equipment that'll perform correctly and do the job without a hitch? Is your smoker working correctly? Do you have a good quality smoker thermometer? If you don't have the proper tools, it will surely hamper your efforts. The SMOKE thermometer made by Thermoworks is my favorite smoker thermometer these days. It has dual probes, one for the meat and one for measuring smoke chamber temperature, plus easy-to-use controls. If you want to smoke great quality meats, a high quality smoker thermometer is one of the best investments you can make. A great thing about this thermometer is that Thermoworks sells a variety of specialized temperature probes for different purposes. So if you want, you can buy a second meat probe and use it in place of the smoke chamber probe. That's great for checking both dark and light meat of the turkey at the same time.